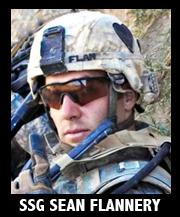 U.S. Army Staff Sergeant Sean M. Flannery, 29, of Wyomissing, PA, assigned to the 2nd Battalion, 502nd Infantry Regiment, 2nd Brigade Combat Team, 101st Airborne Division (Air Assault), based in Fort Campbell, KY, was killed on November 22, 2010, in Kandahar province, Afghanistan, when insurgents attacked his unit with an improvised explosive device. He is survived by his fiancee Christina Martin, mother Charlene Flannery, and brothers Sergeant Brian Flannery and Devin Flannery. *3 Seconds down to the bottom of the front squat, then pause for one full second the up as quickly as possible, then reset, breath, tighten up and perform another front squat with no tempo restriction. Build to the heaviest load possible.